It’s been almost 5 months since we sold our house and moved into this adorable apartment. The initial plan was to stay here for 12 months max while we built our dream house, but as it tends to happen in life, our plans have changed a bit and as of today we aren’t too sure how long we’ll be in here. 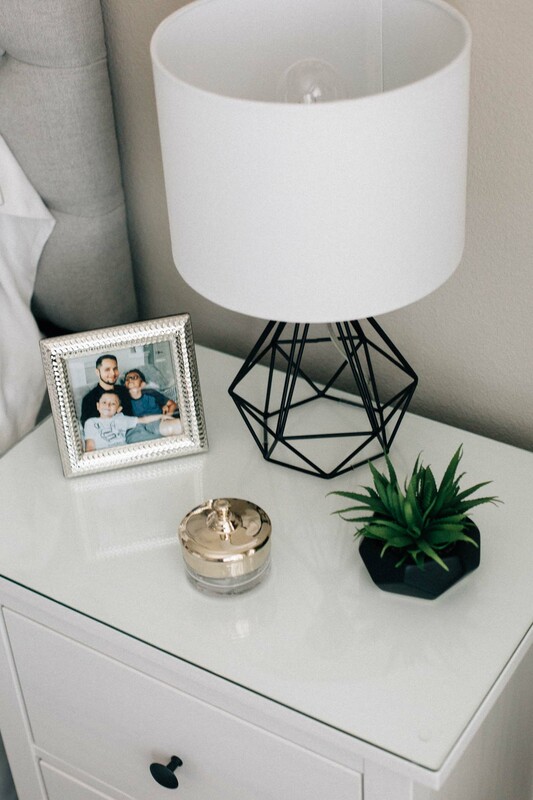 Because of the uncertainly of how long we’ll be here and because this will not be our permanent home, I felt a little limited on what I wanted to purchase for this room. At the same time though, I wanted to make sure the room was not only a beautiful oasis for both Erick & I, but also functional and comfortable. 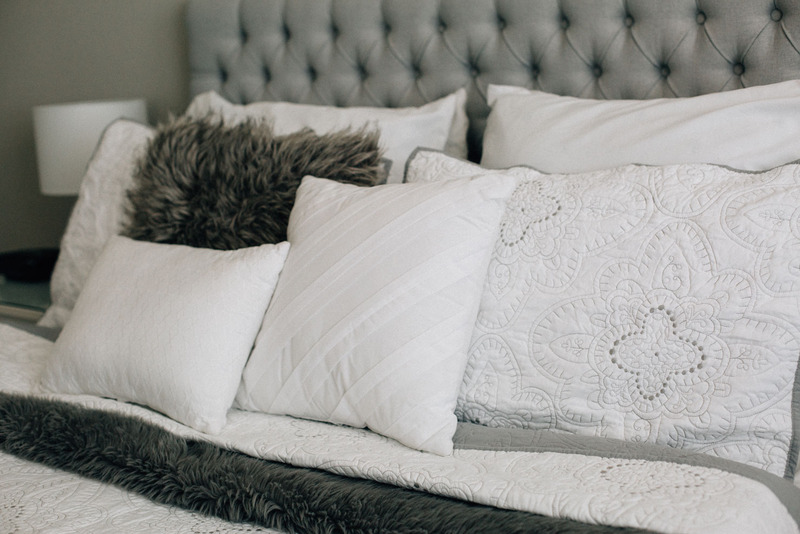 I am so excited to finally be sharing some pictures of our space, or like the internet likes to call it, our master bedroom reveal. Gosh it just sounds so cheesy! Haha! If you follow me on Instagram you may have already caught a peek of the gorgeous art print from Minted. I am seriously obsessed with it and love the way it finished up the room. 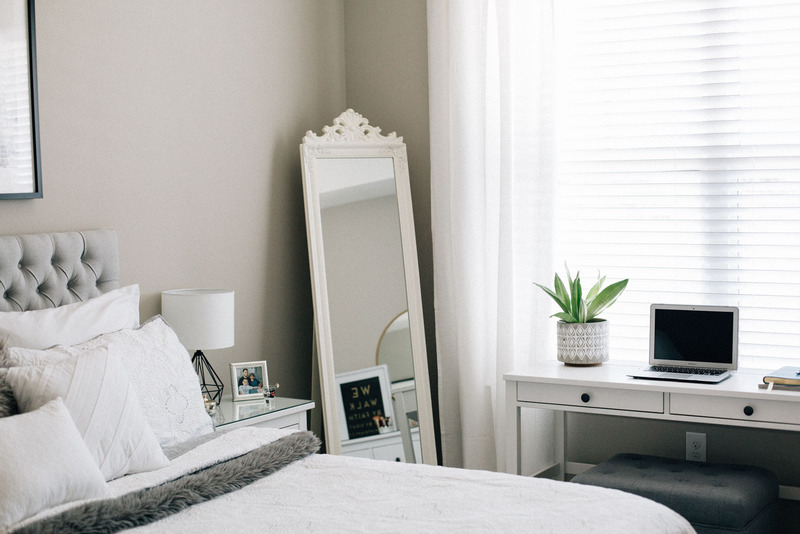 From the very beginning I knew I wanted this room to very clean, simple and airy. 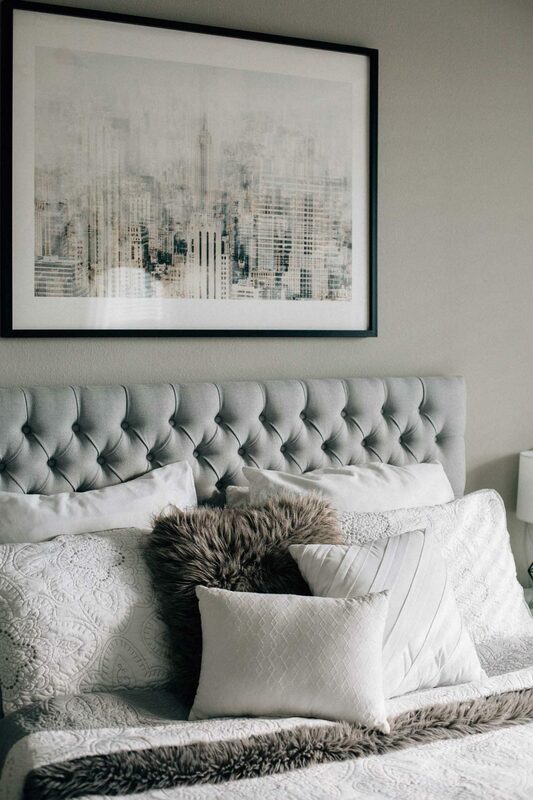 I love a white and grey palette for the very same reason. It makes the room feel bigger, cleaner and somewhat serene. I added a few touches of black with the furniture hardware (original hardware, we didn’t see the need to switch them out) and the Minted art frame. I added a live snake plant and a tiny faux succulent for a bit of an ethereal vibe. I am a total plant lady and must have at least one in every room. 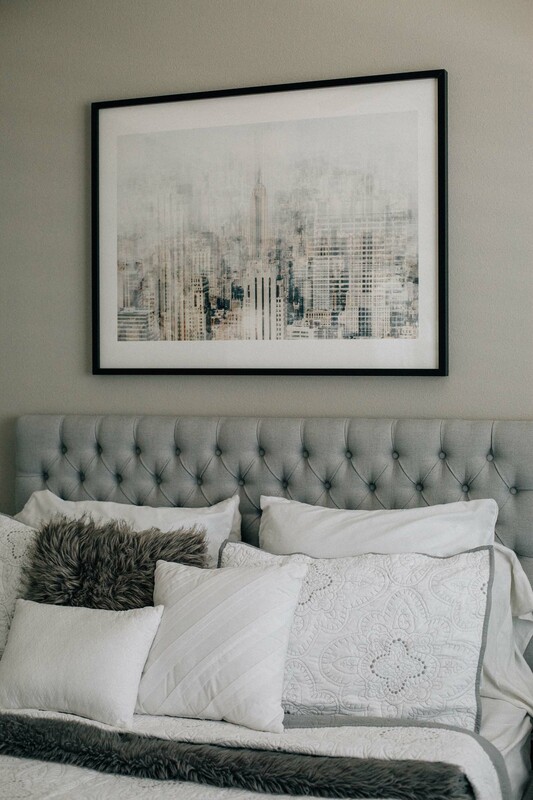 We love the way the Minted printed art finished off our room.Plus want to know the reason behind why we chose the “Big Apple Blur” print? For one, and most of you know this, New York is my absolute favorite city! So that was a no brainer. I love this print SO much. I can honesty stare at it over and over again and find new beauty in it every single time. The name “Big Apple Blur” represents the high paced life and incredible energy of the city. Erick and I feel like that pretty much represents our own personal life. We are always on the go and have a million things to do. Some weeks seriously feel like a blur but we absolutely love it. This constant energy happening in our home keeps us going. 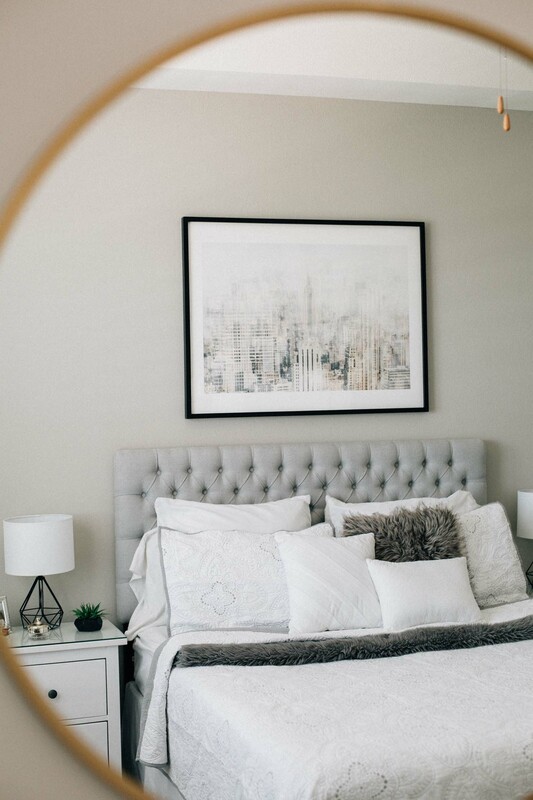 Thank you so much for stopping by and checking out our master bedroom reveal. Have a great weekend and if you’re in the Florida area, we are praying for you!! Hello Lilly, I love your post. I am so excited to decorate my bedroom with your thoughts. I love the white and gray color combination. It is attractive and feels relaxed. Thanks!